Quick reference/walkthrough/how-to on obtaining packet traces in NetApp Clustered Data ONTAP (8.1/8.2+). Comes in 7 brief parts - some parts can be skipped if already done! 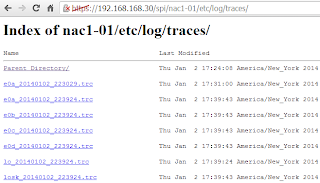 Note: This is optional; you could just have the traces generate in /mroot/etc/log. Note: Depending on port and filer in question, packet traces can generate at a rate 200MB per minute or more - please exercise caution to not fill up the root volume with traces! 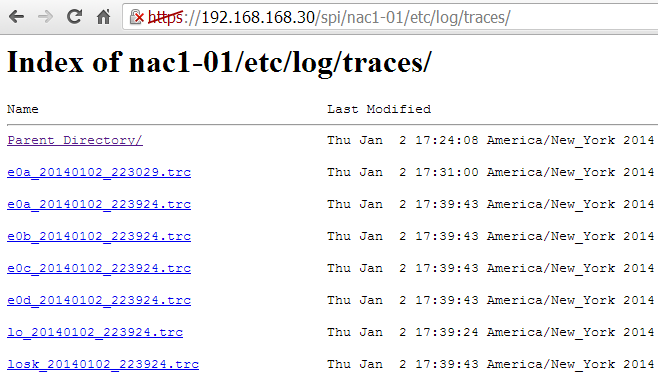 Enter https://CLUSTER-IP/spi/NODENAME/etc/log/traces into your web browser, login and click the filenames to download! Note: Please exercise caution with rm *.*! Consider using ls and ls *.trc to get more insight into the contents of the folder, and then rm TRACEFILE.trc to remove files individually. Not covered here but … Using your favourite packet analysis tool/network protocol analyzer - such as Wireshark from http://www.wireshark.org - load in the trace file.